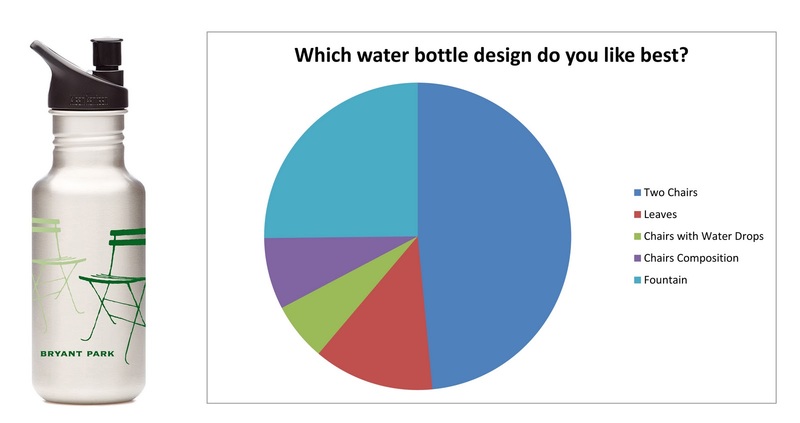 Thanks for voting to choose our new waterbottle design. Our Urban Designer Neha Sabnis created five thoughtful options for our signature Klean Kanteen, but we are only able to produce one to sell in the Bryant Park Shop. Your votes have been tallied, and a winner has been selected with an overwhelming majority of almost 50%. Two Chairs it is! Neha will work with our design team to tweak the style slightly and test a prototype. The basic concept for the two chairs design will remain relatively the same, and should hit the shelves this Spring. Look for the opportunity to purchase it at our online store in early to mid March.